This is a hearty winter dish. Swiss Deli Spicy Bratwurst with its coarse texture, chilli and soft cheese filling blends perfectly with creamy potatoes and sweet caramelised onions. You can also use any other Swiss Deli bratwurst sausage such as Nurnberger or Pork Bratwurst. 1. Melt the butter with 50ml olive oil in a medium-sized saucepan. Add the red onions, balsamic vinegar, rosemary, and half the sprigs of thyme and seasoning. Simmer gently for 30–40 minutes until the onions are sweet and soft, stirring frequently as they cook. 2. Place the new potatoes in a medium-sized saucepan that has a tightfitting lid along with 1 tablespoon olive oil, the garlic, the remaining thyme and a little seasoning. Fry very gently for 30–40 minutes – the same amount of time that it takes to cook the onions. Give the pan a vigorous shake from time to time. 3. Place the Swiss Deli Spicy Bratwurst in a small frying pan with 2 teaspoons olive oil and cook over gentle heat, turning occasionally, until golden brown. 4. Transfer the cooked potatoes to a bowl, add the cream and parsley and barely crush with a fork or potato masher. 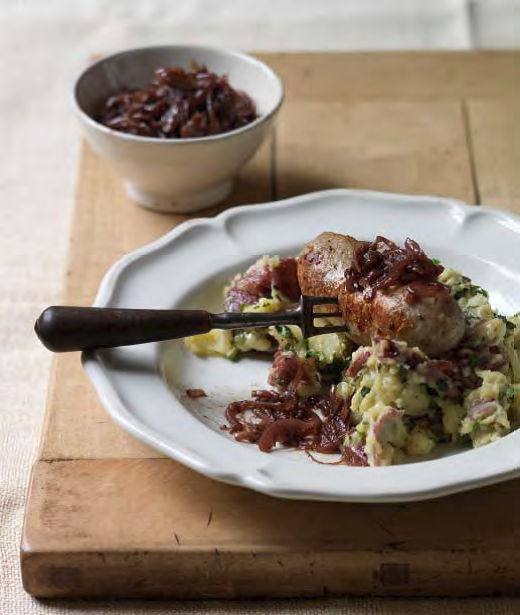 Serve alongside the sausages, scattered with the caramelised red onions.